Trip preparations are reaching a climax this week as the countdown to Colorado begins in earnest. In less than 48 hours, I will be on the road to Durango and I am keeping my fingers crossed for prolific wildflowers and spectacular weather. Speaking of weather, now is the time when I begin to obsess over forecasts. So far, I’ve confirmed that afternoon thunderstorms occur reguarly and a couple of sites are actually predicting days of rain. Yikes! As it is, this news caused me to rethink my itinerary and I have some tentative backup plans in mind – just in case. Before I discuss those, I’d like to share with you my mostly flexible plans for this trip. Day one brings me to Durango where I’ll be exploring the La Plata mountains in the far corner of the state with a short hike to a high alpine lake. For the next couple of days, I’ll be near Creede to meet a friend where we’ll explore the Wheeler Geologic Area. For those of you not familiar with this place, it was originally designated as Colorado’s first national monument, but later lost its status due to the remoteness of the area. From the looks of it, you might think Utah or even Arizona. Departing from Creede, my primary destination will be areas around Silverton most notably the Weminuche Wilderness area (see previous blog). Depending on my mental and physical state, I researched several areas that I could potentially explore. These include: Ruby Lakes, Highland Mary Lakes, Hope Creek, and the West Fork Trail. These trails are scattered throughout the wilderness so a lot will also depend on logistics and of course, the weather. Another primary area of interest in Ice Lake Basin in the San Juan National Forest. This is a popular area known for its spectacular scenery, gorgeous wildflowers, and large crowds. A couple of factors play into my visit. The primary variable is going to be….drum roll please…the weather and how comfortable I feel backpacking during potentially deadly summer monsoon storms. My goal is to spend two nights in the upper basin, which would give me enough time to scout out the most optimal sunrise compositions, which of course, I’ll be sharing with you. After that, it’s a couple more days in the Weminuche Wilderness exploring more lakes, peaks, and wildflower fields. That’s my trip in a nutshell and do I have some backup plans if rainy and gloomy days impede on my time in the mountains. My first trip alternative is the Great Sand Dunes National Park. I have never been to this place and I love photographing and exploring sand dunes, so this is certainly a possibility. The weather forecast looks promising there and the high temperatures should be pleasant. The downside it is a few hours out of my way so requires plenty of extra driving. My other options closer to home include: Coyote Buttes, Bisti Wilderness, and exploring the ruins around the four corners area. The biggest drawback to these possibilities is the heat. I’d prefer not to hike in temperatures in the low to mid 90’s so these are excursions for a different time of the year. That being said, I plan on making the most of my time so I will do what I have to do to get the best images possible. In conclusion, I am looking forward to sharing with you some of the images and experiences from this trip in the upcoming few weeks. If you have any tips, suggestions or advice I’d love to hear from you. Thanks so much for reading and I hope you enjoyed this update on my travels. Mid summer marks the time when a limited window of opportunity opens to explore some of our country’s most dramatic alpine landscapes. This year marks my fourth annual pilgrimage into some of the most wild and remote places in the Western United States. 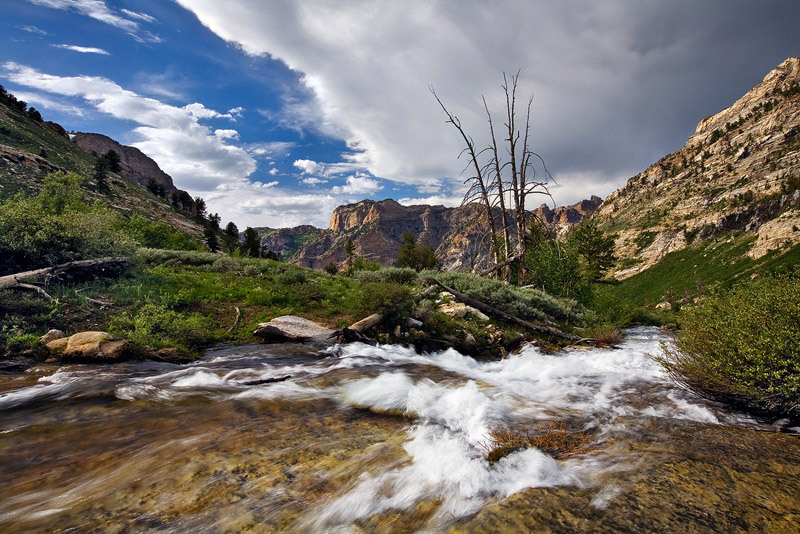 Some of the places I’ve been to in the past include: the Ruby Mountains, the Great Western Divide, the Bechler River Wilderness, and the Galatin Mountains. Depending on the location, there is at most a three-month window to get to these places before the inclement weather settles in. This is the main reason why summer has a special place in my heart. For me, it is the most intrepid time of the year. This year I am planning a visit to the Weminuche Wilderness. To those of you not familiar with the area, the Weminuche occupies the far southwestern corner of Colorado to the immediate east between Durango and Silverton. Its location is at nearly the epicenter of the San Juan Mountains and at just under 500,000 acres, it is Colorado’s largest wilderness area. This is a place that contains three 14,000 foot peaks as well as the headwaters for many major streams and rivers including the Rio Grande, San Juan, and Animas Rivers. 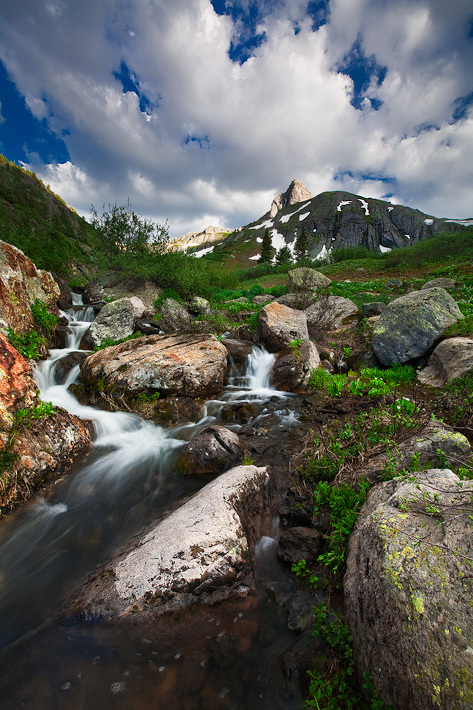 The Weminuche is also the state’s deepest and most impenetrable wilderness. Many of its spectacular back country locations are accessible only by long hiking trails where days of backpacking travel are necessary. Some years, the trails are snowed in until the middle of July and a snowstorm is not uncommon in September. To date, I’ve spent about a week in the state of Colorado on two different trips that both involved staying in my favorite place called Telluride, which also happens to be nearby. During my travels, I’ve driven around the western periphery of the Weminuche, but I have never ventured into it. The Weminuche proper is surrounded on almost all sides by other wilderness areas, generally consisting of the same mountains and rugged terrain, but technically of different names. Trying to familiarize yourself with a general wilderness area this large and complex is like trying to put together a 1000 piece jigsaw puzzle. I am also waiting on several more maps coming in the mail. The research is intensive. 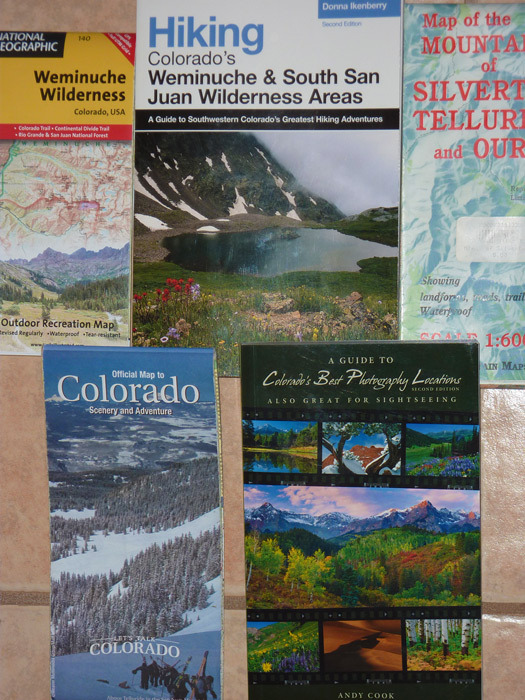 For me, it started with a map followed by a guide-book and then more maps and books and finally Internet research. Moreover, this will be my first solo backpacking trip in several years and will also be my longest. Some of the other major considerations I must take into account are: road conditions, weather, driving distances, supplies, hiking miles, wild animals, altitude acclimatization, and wilderness rules/regulations. Mental preparation becomes as important as physical preparation. One of the focal points of my preparation for this trip is what do in case of a lightning storm. Colorado is known for its mid summer monsoon storms and its high peaks and lakes are like lightning rods. What happens if an electrical storm rolls in when I am ten miles and 3,000 feet up from my vehicle? Noted below is the best information I have found on this subject to date. My trip is coming up fast and I have some other ideas and information to share with you about it before I leave near the end of this month. I am also going to post a detailed itinerary and try to make this trip more interactive than what I have done in the past. If you have any suggestions for restaurants, campgrounds, driving tips, or anything at all I’d love to hear from you. I am looking forward to sharing more with you in the future. Have a wonderful day!